Are you planning to resign from your job after taking maternity leave? It's not uncommon for new mothers to change their minds about their plans to return to work following maternity leave. 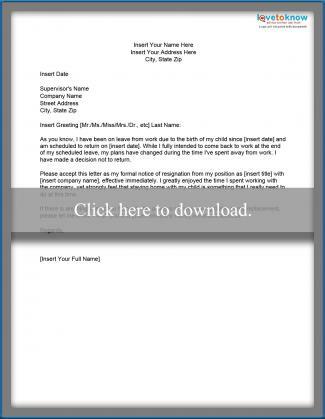 LoveToKnow has created a few editable resignation letter templates designed to be used for just this purpose. Have you decided to leave your job after returning from maternity leave? Many new mothers to decide they really want to stay home after returning to work. If this describes your situation and you'd like a head start on drafting your letter of resignation, click on the image below. Doing so will allow you to access an editable letter of resignation template that you can customize for your situation. If you need help downloading the letter, check out these helpful tips. Have you changed your mind about returning to work after the birth of your child? 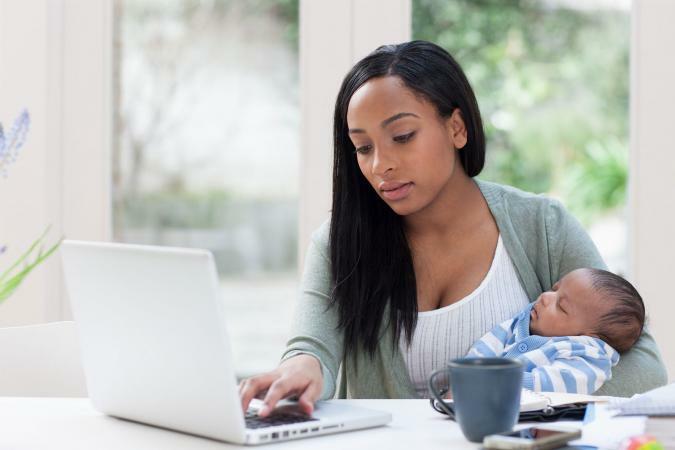 If you took maternity leave from work but realized that staying home with your baby is the right decision for you, it's important to notify your employer of your intentions in writing. 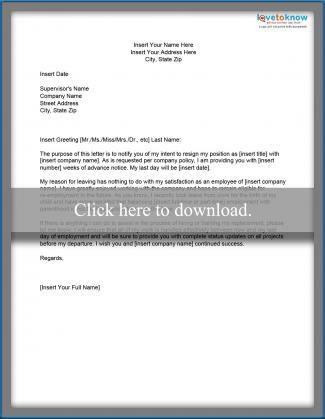 When you're ready to write your letter of resignation, click on the image below to download a sample template that you can easily edit. Before turning in your resignation, it's important to be sure that you fully understand any company policies that may exist related to resigning during leave or shortly after returning. Look closely at your employee handbook and/or benefits booklets so that you are sure that you know all possible consequences associated with your decision. For example, depending on company policy, failure to return from leave may be considered resignation without notice and could impact whether or not you are eligible for rehire at some point in the future - which could also impact references made by the company on your behalf. Additionally, if your company paid part or all of your health insurance premiums on your behalf while you were on leave, there may be a policy that requires repayment if you resign within a certain timeframe following returning from leave.